OAKLAND — Jurors in the Chauncey Bailey murder trial heard police recordings Tuesday morning in which former Your Black Muslim Bakery leader Yusuf Bey IV said several times that Bailey, a newspaper reporter, had “slandered” the business and his late father. Those recordings were played shortly before prosecutor Melissa Krum rested her triple murder case against Bey IV and co-defendant Antoine Mackey after nearly six weeks of testimony and more than 60 witnesses. Bey IV’s lawyer, Gene Peretti, said outside court that the prosecution had failed to reach its burden of proof that the defendants are guilty beyond a reasonable doubt. Peretti said he has advised his client not to testify. Krum declined to comment, as did Mackey’s lawyer, Gary Sirbu. Peretti said he would not make an opening statement before he and Sirbu begin presenting evidence Wednesday. They intend to call “only a handful of witnesses” between them, Peretti said. Bey IV and Mackey, both 25, have pleaded not guilty to murder charges in connection with Bailey’s death and the unrelated deaths of two other men in summer 2007. Bey IV is charged with ordering the deaths of Bailey, Odell Roberson and Michael Wills. Mackey is accused of killing Wills and helping to kill Bailey and Roberson. On the audio recordings, Bey IV told both Oakland Police and investigators from the Alameda County District Attorney’s Office that he knew Bailey, editor of the Oakland Post, was working on a story about the bakery. Krum contends that Bey IV ordered Bailey killed to stop the story from being published and as revenge for other articles Bailey had written about Bey IV’s father, bakery founder Yusuf Bey. Bailey “degraded my father” in print, Bey IV told county investigators, adding that he learned of the pending story from his sister, who had a friend who worked at the Oakland Post. A previous witness, Nisayah Yahudah, who said she was once married to the elder Bey, testified that she worked at the Post when Bailey was killed and that she saw another member of the Bey family with Bailey at the newspaper office. That other family member, Ali Saleem Bey, testified that he was the confidential source feeding Bailey information about the bakery and Bey IV. Krum’s final witness was Oakland Police Sgt. Derwin Longmire, who took the stand for a second time as jurors heard recordings of interviews with bakery members conducted on Aug. 3, 2007, the day after Bailey was killed. In that recording, Bey IV said “guns weren’t allowed at the bakery, period” and denied that live ammunition and spent rifle and shotgun rounds were in his bedroom above the bakery. Several police officers testified they recovered scores of bullets in and around the bedroom and other witness said they had seen weapons in the room that Bey IV controlled. Longmire also said that Bey IV was lying when he boasted on a secretly recorded police video that the detective had promised him he wouldn’t be charged in the case. “Did you make him any promises?” Krum asked. Much of the afternoon was taken up with matters involving former bakery member Richard Lewis, who was brought into court from San Quentin Prison after jurors left. He was convicted last year and sentenced to life in prison in a kidnapping and torture case involving Bey IV and other bakery members. Lewis did not look at Bey IV or Mackey seated at the defense as he walked past them in shackles. 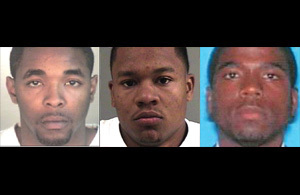 Sirbu first claimed that Lewis — not Mackey — was Broussard’s getaway driver in the Bailey case, based largely on charges Lewis faced in San Francisco that he drove a gunman away from a killing in 2005. He was found not guilty in that matter; the gunman was convicted of murder. But Reardon ruled that the similarities were too scant for Sirbu to present the San Francisco case to jurors. “They’ve been doing that since Henry Ford invented the Model-T,” the judge said of getaway drivers. But matters became more complicated when Sirbu argued that Lewis should be compelled to testify about events at the bakery. Reardon noted that Lewis’ conviction is on appeal and that he also, at least theoretically, could be charged in the murders for which Bey IV and Mackey are on trial. Defense attorneys say Lewis may have been involved in all three killings. Lewis’ lawyer, Pat Hetrick, told Reardon that he advised his client to assert his Fifth Amendment rights against self incrimination to all potential questions. But Lewis, Hetrick continued, said he preferred to “pick and choose,” what he could answer. The hearing on Lewis’ testimony will continue Wednesday morning.